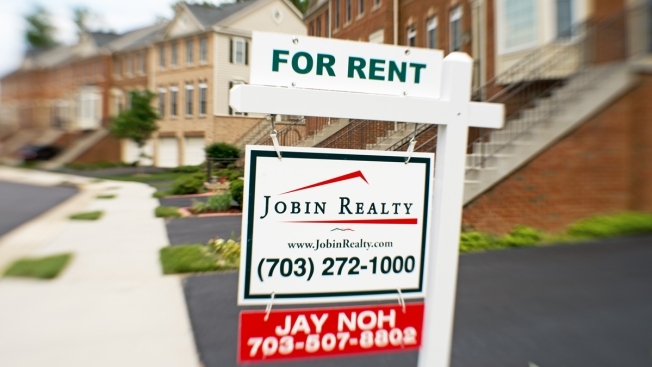 A house for rent sign is viewed on June 4, 2014, in Centreville, Virginia. The number of renters across the United States grew to just over 43 percent between 2006 and 2014, according to a new report by real estate site Trulia.com. According to the survey, half of households in Las Vegas are currently renting, almost a full ten percent increase from the last ten years, NBC News reported. More millennials between 26 and 34 — 67 percent — were renting rather than buying homes, the survey showed. The increase in men in the rental market was greater than women after the mortgage crisis. Minorities, especially Latinos, were having a hard time recovering from the mortgage crisis. A recent Bankrate.com survey found poor credit and lack of funds for a down payment were the reasons many American families rent rather than buy their own homes.